Aging brings many changes to the body: reductions in muscle mass, bone density, sight, and hearing, to name a few. 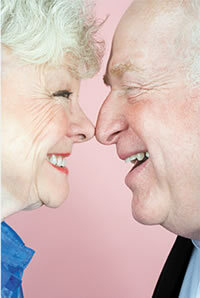 A decrease in the sense of smell, also part of aging, may not be something to which you give much attention. But should you? A study in the October 2014 PLoS ONE found that being unable to identify scents was a strong predictor of death within five years among people ages 57 to 85. The study didn't prove that diminished smell sense caused death, but researchers suggested that smell loss was the canary in the coal mine—an early warning that something was wrong in the body. Dr. Mark Albers of Harvard Medical School says that while the study findings are intriguing, they're not enough to link a loss of smell to death. "I would be cautious about these results. Only a small percentage (less than 5%) of all subjects were found to show poor smell function, and this group accounted for only about an eighth of all the deaths in the study," says Dr. Albers, the Frank J. Wilkens Jr. and Family Endowed Chair in Alzheimer's Disease Research. But Dr. Albers says there is something to the idea of diminished smell being a symptom of another problem. "What in the past was attributed to age-related smell loss may represent an early sign of neurodegenerative disease," he says. He recommends that you consider investigating a diminished smell sense that lasts more than a few weeks with your primary care doctor or an ear, nose, and throat specialist.